In Make Plus, you’ll find an option to add section IDs or classes in the Configure panel of each builder section. These settings make it easy to add custom styling to your individual builder sections, or create internal links for one-page sites. Use the section ID field in each builder section to create links to various sections on a one-page site or direct visitors to a particular section on that page. 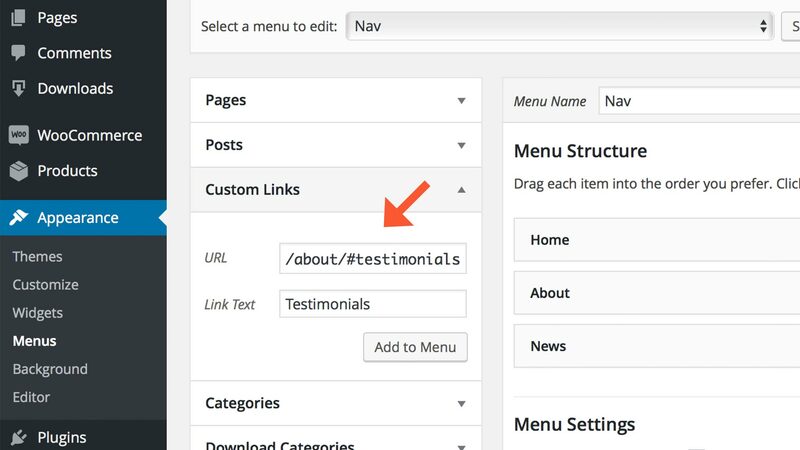 For example, if you have a section on your about page (your-site.com/about) for testimonials, you might add a section id called testimonials. For more about creating and using custom menus in WordPress, see this page in the WordPress Codex. Adding classes to your builder sections makes it easy to apply custom CSS styles on a per-section basis. The easiest way is to insert your custom styles to Additional CSS tab in Customizer. In case you prefer to edit a real style.css file, make sure you have a child theme of your active theme activated. You can find a guide to Make’s child theme here.